Fun With Party I.D. : Trump vs. Rubio vs. Cruz In The Electoral College - Who Beats Clinton? From an electoral college perspective, Florida Senator Marco Rubio is the best positioned Republican candidate remaining to win the White House. Current polling coupled with historical analysis gives Rubio the largest number of electoral college votes for a Republican since George Bush, Sr. in 1988. 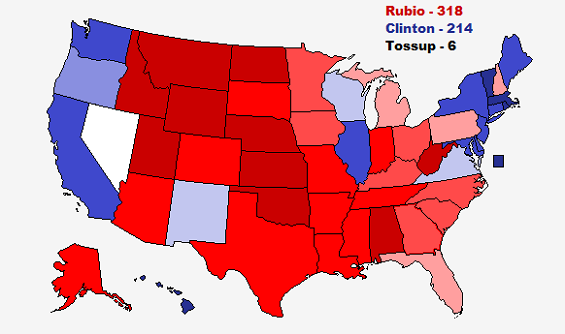 Rubio flips the previously blue states of Colorado, Minnesota, Iowa, Michigan, Ohio, Florida, Pennsylvania, and New Hampshire red. Those eight states alone represent 112 electoral college votes. State projections based off historical analysis due to a lack of post June 2015 polling are: AL, AR, CT, DE, HA, ID, IN, KS, LA, ME, MD, MA, MS, NE, NV, NJ, NM, ND, OK, OR, RI, SD, TN, TX, VT, and WA. Unlike Rubio, the latest state polling puts Texas Senator Ted Cruz in danger of a 2004-style electoral rut, only this time, with the Republican losing. While Cruz is able to flip a handful of Obama 2012 states (Colorado, Minnesota, Iowa, and Ohio), it isn't enough to hit the magic mark of 270. So though it appears Ted Cruz would improve on Romney's margin from four years ago if the election were held today, he would still fall short of capturing the White House. 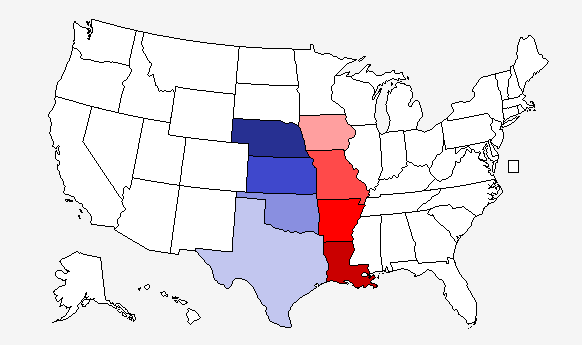 State projections based off historical analysis due to a lack of post June 2015 polling are: AL, AR, CT, DE, HA, ID, IN, KS, LA, ME, MD, MA, MI, MS, NE, NV, NJ, NM, ND, OK, OR, RI, SD, TN, TX, UT, VT, and WA. Of course, this brings us to the proverbial elephant in the room - Donald Trump. Contrary to poll after poll indicating Republicans believe the billionaire businessman to be the most electable candidate of the field, he's actually the least electable from an electoral college perspective, at least for now. Not only does Trump flip fewer states to the GOP column than Rubio or Cruz (only winning over Nevada, Colorado, and Ohio), he loses a couple of Romney states to Clinton (Kentucky and North Carolina). 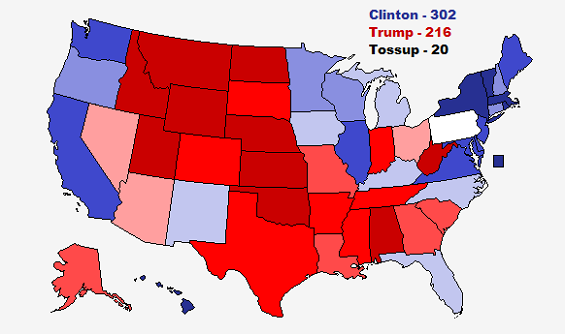 State projections based off historical analysis due to a lack of post June 2015 polling are: AL, AR, DE, HA, ID, IN, KS, ME, MD, MS, NE, NJ, NM, ND, OK, OR, RI, SD, TN, TX, VT, and WA. Electability does not operate in a vacuum. It's fluid. So naturally, campaign developments such as a primary victory or a major debate stumble could alter these maps remarkably quick. But as it stands today, the Republican Party's third place candidate, in terms of primary popular vote and delegate count, is 1st place in terms of ability to win in November.